It is important to control the concentration of your nutrient solution. Burning of roots or foliage can occur if the concentration is too high. If the concentration is too low then deficiency symptoms can occur. 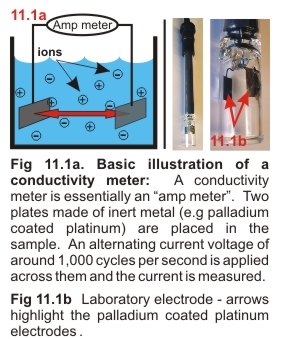 This chapter explains how to successfully use conductivity as a tool for controlling nutrient concentration. A “Conductivity Meter” is a device used to help monitor the concentration of nutrient solutions. It is also known as an EC meter, CF meter or TDS meter. ‘Conductivity’ represents the ease with which a solution conducts electricity. Solid substances known as 'salts' (e.g. sodium chloride, potassium nitrate), yield 'ions' when dissolved in water. 'Ions' permit the flow of electricity through the solution (Fig 11.1a). Increasing the concentration of ions improves the ease with which the solution carries an electric current and therefore causes a higher conductivity. Hence, an EC meter can be used to detect the presence of salts and their approximate concentration in water. Not all solutions or liquids conduct electricity. Water soluble ‘organic’ substances such as sugar, vitamins and hormones produce very few ions when dissolved in water and consequently yield zero conductivity. Similarly, many liquids such as petrol, alcohol and distilled water yield zero conductivity.